Are Harley-Davidson Profits About to Take a Hit? The motorcycle company is getting promotional to move old bikes that aren't selling. Harley-Davidson (NYSE:HOG) has been adamant its motorcycles are worth the high price they charge, and it won't cheapen the brand by discounting them like its rivals do. When you own half the market and your nearest competitor only just broke into the double-digit share range, you can afford to do that. Yet maybe the dramatic 12% decline in first-quarter motorcycle sales has finally gotten to the Milwaukee-based company. Very quietly, Harley-Davidson is offering buyers up to $1,500 off if they purchase a bike by the end of the month, which also happens to be the end of their quarter. Trying to move more bikes with this factory incentive may indicate that sales are much weaker than expected. Harley put up a brave front when it maintained that despite its dismal sales report, it still expected to ship between 67,500 and 72,500 motorcycles in the second quarter, and between 231,000 and 236,000 motorcycles for the year. Although the expected quarterly numbers were as much as 17% below last year's shipments, the full-year figure would only be off by as little as 2% from 2017. Shipments aren't sales, of course, but you can't sell new bikes if you still have your old models on the floor, and that's what Harley-Davidson is trying to do, here. It needs to clear out its old inventory to make space for the new bikes coming in. According to the promotional offer, the discount is only good on 2017 and 2018 model year Softail and touring bikes; higher-end CVO models are excluded. That's a big problem, because it means dealers still have bikes that will be considered two years old when the new 2019 models are unveiled in a couple of months. If they still have them on their showroom floors collecting dust, dealers will need to heavily discount them to move them, pinching profits. It looks like Harley throwing out a factory promo is an attempt to help on that front, but it doesn't preclude buyers from negotiating a good deal on the leftovers and then throwing the factory discount on top. It should be noted this is not a broad-based promotion open to everyone, but rather something of a curated list for those Harley-Davidson wants to incentivize to come in, whether you've taken a riding academy class, participated in their museum, or had some other interaction with the company over the past few years. That does limit how many bikes will get discounted, but it also sets up the possibility that it will turn off more than a few would-be customers who are in the market, but aren't privy to the discount. A look at discussion boards for Harley enthusiasts shows this is already occurring. Harley can afford it, though, even though sales are in a tailspin. Because of its reluctance in engaging in discounting, the bike maker's profit margins haven't really fallen much. Data source: Harley-Davidson Q1 2018 SEC filing. As the biggest motorcycle maker in the U.S. with a 50% share of the heavy bike market (Polaris Industries as the No. 2 competitor has only recently broken into the double-digit share range), Harley can afford to bide its time. But it can only do this for so long before it needs to respond, and that time may have come. Investors may want to prepare for a big revision downward as the year progresses. HOG Total Return Price data by YCharts. 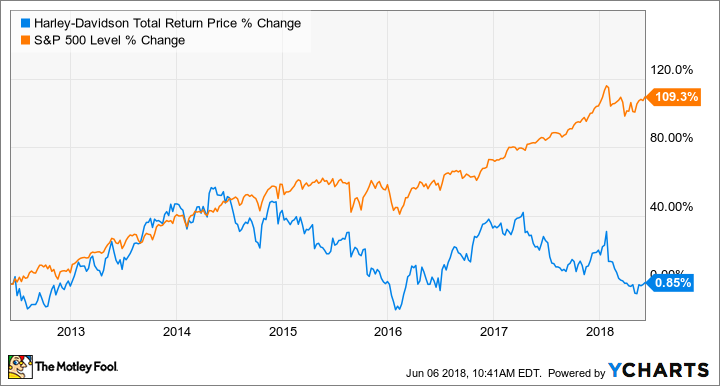 Investors have been the big losers, though, as Harley-Davidson's total return over the last six years is essentially nothing compared to a doubling in value of the S&P 500. There's also no indication that will improve. Sales are down, which is causing Harley to finally get promotional, which may cause its profit margins to narrow further. With its stock down 25% from its 52-week high, it may go lower still. Although it is not an across-the-board deal, the fact that Harley feels it needs to engage in discounting after having held out for so long indicates there are deeper problems with its bikes. It also means that when it does finally report its quarterly numbers, sales may be even worse than you thought they'd be.